There are several reasons why SynaMan and Syncrify cannot send emails out to the intended recipients. This page describes most common mistake users make as well as some configuration settings on the SMTP server. Every email generated by SynaMan and Syncrify must be sent to an SMTP server. 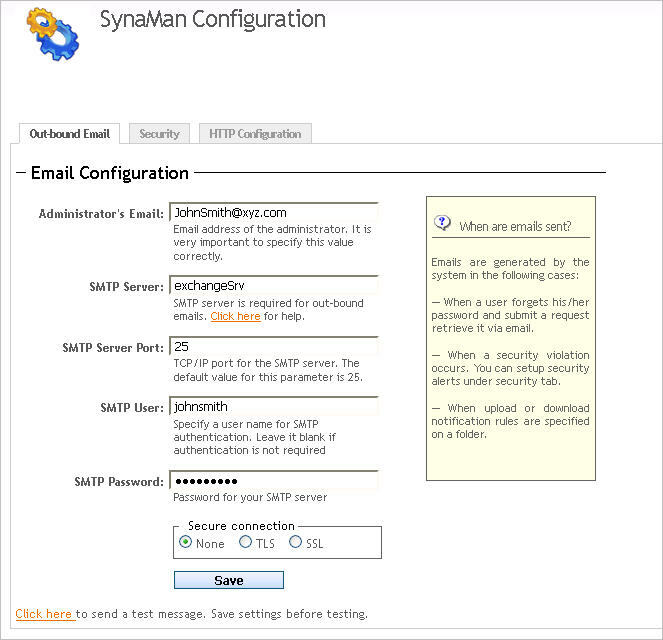 The configuration for this SMTP server is specified under the Outbound Email tab under SynaMan's Configuration screen. Click here to see a screenshot. When you create a public link in SynaMan and email is sent to someone on the Internet. In the background, this email first goes to your SMTP server, which then delivers it to the recipient's email server. Since you are sending an email to an outside user, this is called relaying in SMTP's terms. Configure your SMTP server to allow relaying for the IP address where SynaMan or Syncrify is running. In this case you do not have to specify any user id/password in the Email Configuration. Use SMTP Authentication. This means you have to specify user credentials (user ID and password) for a valid user on the server. Once server validates the identity of the user, it will allow relay a message to someone on the Internet. After saving the values in the configuration screen, run a test using the link you see at the bottom. Check the host name, user id, password and security settings are correct. Refer to SynaMan/Syncrify.log file in $INSTALL_DIR\logs folder for a detail error message. The only reason for this to happen is that your SMTP server does not like either the SENDER or RECIPIENT of the message. Although most email servers will accept any value for SENDER and RECIPIENT once authentication is used, some servers can be configured to apply more stringent rules. Since the public link is being created by Jane, her email address will appear in the FROM field and depending upon the configuration of your Exchange, it may or may not reject this message. To check if this is the problem, try generating a public link using John's account and see if the message goes through. To fix this, you must configure your SMTP server to accept messages from any sender as long as SMTP authentication is used.